For the home computer versions from 1990, see Space Harrier II (home computers). 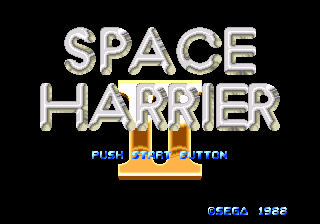 Space Harrier II (スペースハリアーII) is the official sequel to the arcade game Space Harrier. It was initially released for the Mega Drive on October 29, 1988 as one of the two launch titles for the system in Japan (the other being Super Thunder Blade). Gameplay is nearly identical to its predecessor (move around the screen with the D-pad and use , , or to fire), though it is now possible to select which level to play and the graphics/music are different, the bonus stages have been changed from riding to shooting, and certain properties, such as rapid fire, are configurable by hitting at the title screen. The game was notable for the time for its use of digitized voices - an example of the technical advancements the Mega Drive offered over its rivals. However, unlike the arcade original, the Mega Drive could not handle scaling, meaning the graphics were pre-rendered at various sizes. This, along with the slightly lower framerate, results in a less-smooth gameplay experience. Like the original Space Harrier and other games of the era, such as Hang On or After Burner, the game increases the score based on the player's survival time. However, as the score counter doesn't stop during boss fights, it possible to accumulate the maximum amount of points by simply avoiding attacks and not attacking the boss. The Mega Drive version of the game was re-released for the Wii's Virtual Console service in 2006, and for Steam and iOS devices in 2010. The iOS version was removed from sale on iTunes in 2015. In 2017 the game returned to iTunes and was newly added to Android devices as part of Sega Forever, with the title Space Harrier II Classic. Main article: Space Harrier II/Changelog. Main article: Space Harrier II/Magazine articles.